Do You Have the Ability to Open Doors for Your Child? My son is in 9th grade and is ADHD. He has very poor executive functions causing problems in math and writing. He has been evaluated twice with the school deciding that he has normal IQ. I know of many other cases where poor executive function has not been recognized as a reason to give IEPs, yet children with this problem are struggling and failing. How can we get the law changed? I don’t see that either the IEP law or that the law regarding the definition of “‘child with a disability” needs to be changed. 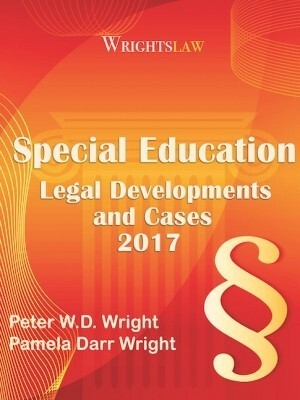 The law is clear that if a child has a disability, and the disability adversely affects educational performance, then the child is entitled to services under IDEA 2004 and entitled to an IEP. The law also says that child does not even need to have a label to be eligible for those services. 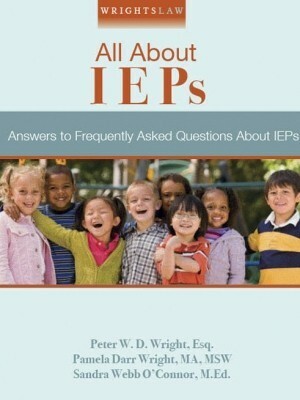 Whether your child has an executive function disability, has the xyz syndrome, or even the abc condition, if that disability adversely affects his educational performance, then your child is entitled to an IEP. 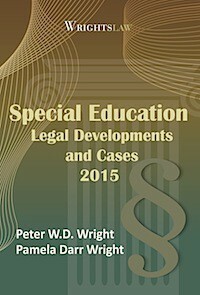 If you read our Wrightslaw Special Education Law book, at page 50 you will see my footnoted comment that relates to the legal definition of a child with a disability. 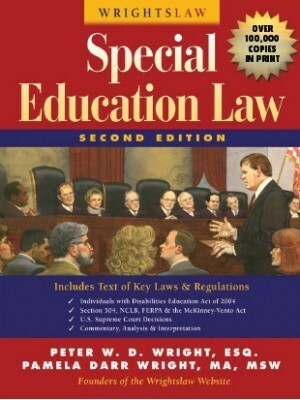 (ii) who, by reason thereof needs special education and related services. I explain on that page that a child with a disability is not automatically eligible for special education and related services under IDEA. The key phrase is “who, by reason thereof, needs special education and related services.” A child can advance steadily from grade to grade, without failing grades, and still be classified as a child with a disability. For the legal authority for my comment see Regulation 300.101(c) and 300.8(2) and footnote 16. Again, rather than changing the IEP law or the law regarding the definition of child with a disability, learn how to effectively present the data about a child’s unique needs. The person seeking to find eligibility for a child needs to learn how to present the data in a way that others agree the child needs service. Don’t focus on what has failed for one or more parents and assume that this is the standard. It is not. 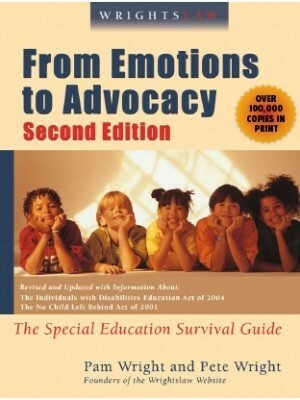 To advocate for your child, you need to learn for yourself what the law says. Learn how to get services. 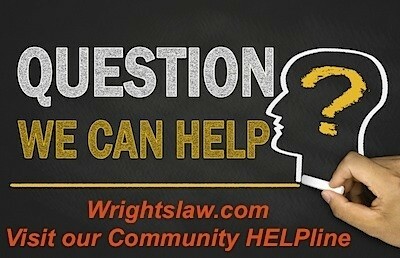 Start your self education on Wrightslaw. Your perspective and ability to open doors for your child will be changed forever. 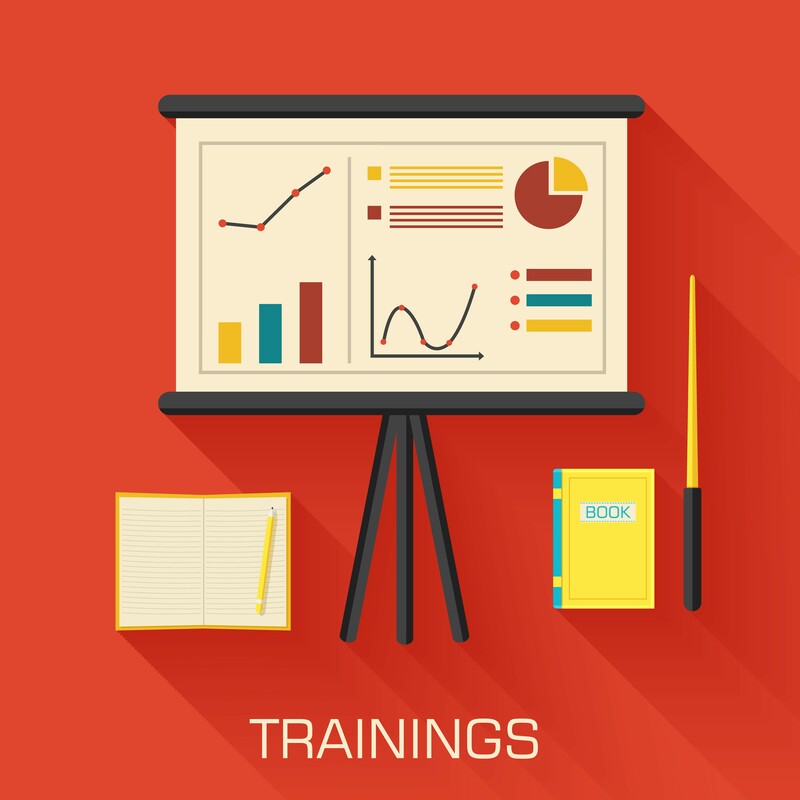 Self-Education: Summer School for Parents and Summer School for Advocates. 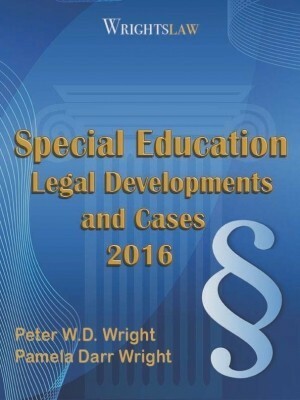 This entry was posted in Advocacy, Eligibility, FAPE, IDEA 2004, IEPs, Special Education Regulations and tagged "Child with a Disability", Eligibility, Executive function, Grades, IQ Scores, Labels by Pete Wright. Bookmark the permalink. My high school son has a history of severe executive function deficit. He is in 10th grade. At home with support, it takes 1+ hours to sort through the multiple places assignments are posted by 8 different teachers everyday after school and one day over the weekend. 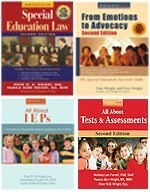 We are being told that high school teachers can do whatever they want just like college professors and that asking them to reduce the number of places they post assignments or requesting assignments in advance for weekly planning in not a reasonable accommodation for a twice exceptional student with severe executive functional challenges. Even though it would decrease his overwhelm, anxiety and demands on an already weak working memory plus save an enormous amount of time everyday and help him practice compensatory skills. What are the best tools to use as evidence to support the need for more support or related services regarding EF? I am so astonished to have read all the problems that mothers and students are going through in schools. I am having such a very hard time with my 9th grade son teachers. I am not saying here that my son is a saint no, he probably gives little trouble and some times may say some thing that may not be appropriate; but they are kids; trying to find themselves and need help and direction, they don’t need suspension inappropriate words that they send home to you about your child. I think that the teachers should get a course on the power of words,then and only then they will able be to choose their words they say to us and our kids.I think the problem is that these teachers are going into this job without having what it takes to be there. Kimberly – First of all I am not understanding how the school can drop your child from special ed services. If your child is on an IEP they must send you a Prior Written Notice of a change in placement like that, have a meeting with you and get your permission/signature. If they truly have done this change of placement without your approval they are out of compliance and you can set up a meeting and discuss it. Read as much as you can on the subject so you are knowledgeable. If you have a professional person that can assist you bring them in as well. My son was dropped from the SPEd program due to my refusal to medicate. His teacher insisted on medicating and they reversed all of the previous school’s diagnoses, although they had the same overall results from the testing except for the data from his teacher, and insisted he’s ADHD and needs medication. He is capable of sitting in an office setting for a full day without any interruptions, the issue is he is not educationally challenged. His issues are soley peer related and emotional. He does not relate to his peers and does not likee to be in an environment full of kids at all. Now his teacher is taking out her anger on him and the administrative staff refuses to remove him from her classroom. I have contacted the central administration and the principal is going against what I Ihave been told will happen. I am at my wits end. I agree. My daughter has ADD, poor focusing and poor executive functioning skills. I concentrated on the 3rd EPC to show that her disability does affect her classroom and test taking performance. I had the state tests broken done to show her poor writing ability, and below grade level. Her socialization was addressed also by her teacher after I brought in classroom work, tests, actual copies of state tests that your principal can obtain. Never give up. I find I can work very well with teachers and principals and need to be the advocate with the special education department. Julie I am guessing your son’s school did a school based PT and OT eval for the initial IEP. It is not out of the question that services may not be needed based on his current motor skills but depending on the type of CP it would likely be beneficial to work on muscle strengthening and coordination early on at school. With a medical diagnosis of CP I am not sure why he was not found eligible for meeting the criteria of Other Health Impairment with at least minimal monitoring by the school OT and/or PT. You can pursue a 504 plan for OT and PT services at school, however the school will not receive reimbursement as they would for IEP services. However, and you and the school would be better protected with an IEP which would state clear measurable therapy goals and provides more procedural protections for you. Every parent has the ability, we just don’t always know we have it. Imagine how things would be if every parent of every child with a disability realized they had that ability and power to open those doors and began opening them. My son is 5 and is in Pre K. He has Cerebral Palsy and Is needing OT and PT services in the school. His cognitive function is not impaired. He is smart. But He has declined in his physical function and I feel the school is going to deny him services because they do not feel that his physical disabilities that are getting worse will affect his academic progress. He wears bilateral orthotics. He has visual problems but refuses to wear his glasses and has a lasik surgery consult, He is now weak in his left hand. He has a VP shunt. His neurologist wrote orders for PT and OT for the 2010-2011 school year with specific problems and specific orders to help him with balance, gait training, fine motor skills. The school denied him services during his initial IEP because he only lacked in one area and not two areas. Help me help him! Did the school specifically state why they are reluctant to staff your son into special education? As previously stated, an average IQ in and of itself certainly isn’t a sufficient reason. My son has similar challenges. In mid-elementary school, we managed to get a 504 plan and sometime later an IEP. When he entered 7th grade, he was told by teachers to “try harder” and “you’re old enough to know better now”, but he continued to struggle as executive functioning and related skills seem to be rarely understood by educators. By age 16, we requested an Independent Educational Evaulation at public expense and found a neuropsychologist who conducted very thorough testing . 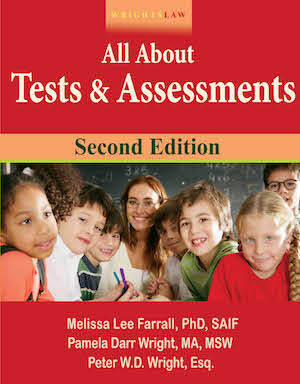 The district continued to agrue against the diagnoses and needed services. 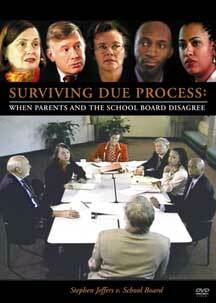 12th grade culminated in a host of issues, including our OCR complaint (which is being investigated). My son is leaving for college tomorrow and with an array of accommodations provided by the college, we hope for a brighter future for our son and the other students to follow.